MySiteMalixi - Online Business Solutions Provider: "The articles I stole from you had several misspelled words. So I bought you a spell-check program." 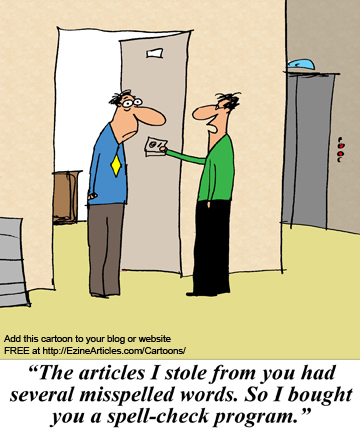 "The articles I stole from you had several misspelled words. So I bought you a spell-check program." "Bob takes his URL tracking to the next level." Interactive Website that connects to facebook, twitter,DIGG and other networking sites? If that's what you wanted to have its a great option to outsource that project development to us. We are a company that provides a total website creative design together with the system database that will work for your purpose of use to get your target market.